I met Amy Sedaris at BlogHer. She was so excited about the Cambodian Bloggers Summit that she agreed to make a campaign video for me. In appreciation of her kindness, I'm including a link to her new book. 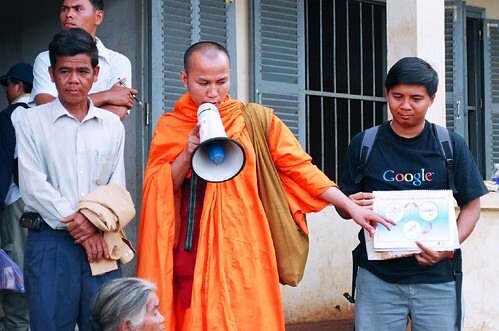 Nonprofit Techies: Please Share Your Knowledge With Cambodian Bloggers From NGOS! T-Shirts Too! I am seeking contributions of t-shirts for the Cambodia Bloggers Summit. Participants will include bloggers who work for NGOS. When asked what I should pack in my suitcase, the response was "tech t-shirts." I've also been cruising the blogs written by Cambodian colleagues. A few work for NGOs. They are exploring technology, open source, social media, and more. 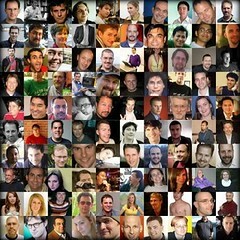 Please take a moment to visit their blogs and leave a comment sharing a little something you know. Ryanne Hodson and Jay Dedman were in Cambodia and are in Thailand right now. They are traveling with Christina Arnold from Project Hope to document her project. Here's the backstory about how they got there, etc. Jay and Ryanne were delivering "video blogging kits" to Sharing Foundation in country staff to begin to capture some video of the work. Jay and Ryanne also took some video of the Sharing Foundation orphanage, computer school, and sewing school in addition teaching staff how to use the cameras. I will follow up to figure out we begin to get clips posted. I love what they did - it really brings the programs to life. I hope that over the next year or two the Cambodian Bloggers or Cloggers can cultivate, grow, and nurture a few video bloggers. I know there are tremendous challenges to that happening, but maybe we can look at finding some solutions, some possibilities. The KM4D Journal is produced by the KM4Dev-community and I was honored to participate on the editorial team for the the recently published issued on "Stewarding technologies for collaboration, community building and knowledge sharing in development." Nancy White and Lucie Lamoureux lead a team editors which include myself, Partha Sarker, Oreoluwa Somolu, Beverly Trayner, and Brenda Zulu. The issues contains articles, case studies, interviews, and community notes. While the focus is on organizations and contexts in development work, anyone who works for a nonprofit, and needs to learn about how to integrate web2.0 in terms of adoption issues, knowlege management, and online community building should read this. The articles are all good, so I can't pick out a favorite. I enjoyed, along with Nancy White, interviewing ethnographer and blogger Dina Mehta, about the role of technology steward in the context of voluntary online disaster relief work. We covered the choice and deployment of software, volunteer organization, mutual support and distributed leadership. Gina Tranpani, Barb Dybwad, and Annalee Newitz geeking out at BlogHer. Blogher: Getting it on for a Cause! Yesterday, on very little sleep, I did a session at Blogher. Britt Bravo did a superb job of moderating. VITA and Kaylyn, fellow panelists, were inspiring. Katie took excellent notes! Thank you! I finally arrived in Chicago after getting up at 3:00 am to catch an early flight. So, yesterday was on less hours of sleep than number of lattes consumed. I had three lattes. Do the math. But, I had an opportunity to meet Sheila Bernus Dowd who writes a blog called Starfish Circle where she shares her insights about the nonprofit community in Silicon Valley. Check it out! It is always fun to meet readers who you have never met face-to-face and so I had to get my photo taken with her! I should be in Chicago at the pre-conference sessions and the reception for BlogHer Contributing Editors right now. 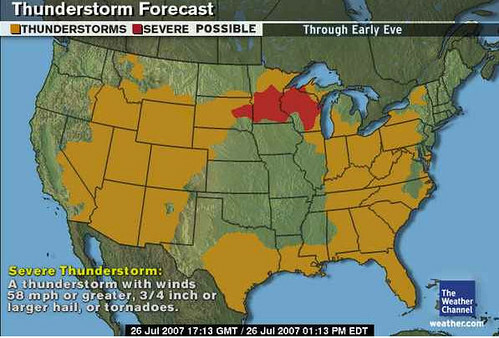 But, all flights out of RI and Boston on United were cancelled due to the above Thunderstorms. I was lucky that I snagged a 6:00 AM flight out tommorrow morning. Hopefully, I will arrive just in time for my panel session, although I hope I won't be too over caffeinated. Wow, check out this slide deck that just found its way into the "nptech" group on Slide Share. Great work! I'm off to my third BlogHer Conference! This year I"m speaking on a panel called "Getting It On(line) for a Cause. While PowerPoint presentations with deadening bullet points are banned from sessions, I a few slides to share. I use it mostly to help me organize my thoughts and not as part of the presentation. My draft which will change drastically can be found here. 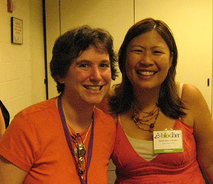 Meanwhile, I'm finally doing the ten-second blogme meme: I'm going to have to use my BlogHer 2005 T-shirt slogan again -- "Enough about me, let's talk about my blog" a big hat tip to Alexandra Samuels. Anyway, I had a chance to pick the brain of Rob Jordan, Idealist Consulting on the phone. He rocks. Just so happens he's doing an NTEN Webinar tommorrow and it probably isn't too late to sign up. If you're already doing something amazing with SalesForce campaigns, please drop a comment here. I want to talk to you. My colleague Mike Seyfang thought there might be someone in my network interested in this opportunity. I nudged Dave to post his slide deck to SlideShare. He has also posted some recent thoughts on this here. On the surface, it doesn't really relate to nonprofits, but there's lots to translate. Now, I'm going to officially nudge Dave to use the SlideShare Slidecaste new feature that allows you add audio to your slides. I would love to hear Dave narrate his slides. 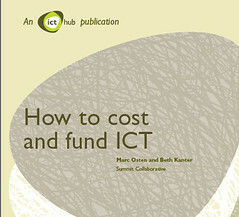 Marc Osten and Beth Kanter have recently completed a step by step guide on How to Cost and Fund ICT (76 page PDF). It's written for a Britsh audience, but that makes very little difference as far as its utility goes to voluntary organizations outside of Britain. In essence, the guide uses a series of worksheets to help lead an organization through some basic logic model development in order to connect impacts with an ICT initiative. Although I think it would still be easy to end up with a technology driven project, this goes a long way toward helping an organization tie their ICT to their program objectives. It's as good a self-guided process for a challenge of this scope as I have ever seen and I hope it gets very wide circulation. You really need to just watch this video. Here's Ryanne's post about it. Katya is hosting a blog carnival called the "Top Five" -- She says we get extra credit if worked in the words Fellini, Martini, or Bikini. So, I decided to select the top five flickr photos tagged with those words. In this case, the top five photos I liked. You'll have to click through to see an enlarged photo, but apparently this place offers bikini bull riding .. 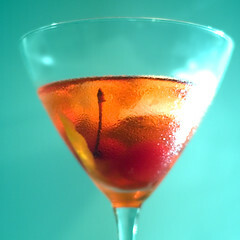 This photo is a manhattan in a martini glass. I like the composition. It was tagged Martini. It's by Thomas Hawk. One favorite photographer in Flickr, although he has left flickr. Click thru to read more. 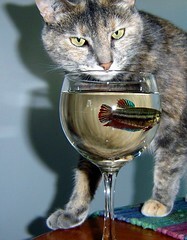 This photo was titled, "A Cat Martini" - but the subtitle should be "in a wine glass." 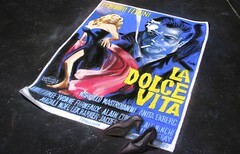 And finally, another Thomas Hawk photo tagged Fellini. Ryanne and Jay Deliver Video Cameras to Cambodia - Thank you! 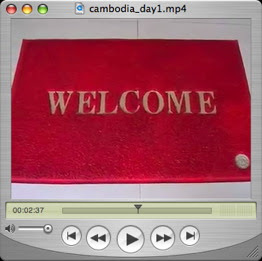 Video bloggers Jay Dedman and Ryanne Hodson are in Cambodia and probably about to leave for Thailand. They are documenting Project Hope International's work to stop human trafficking. They also delivered several video cameras to Sharing Foundation's in country director, "Elephant" and taught him how to do moment capture. Here's the whole backstory. A huge thank you to Doug to donating the kiddie cameras. I'm thinking about the next step - how to sustain a video blog from a rural village in Cambodia that lacks electricity ... I'm thinking about the potential of other video bloggers from that country. I love that photo. I took it during my last trip to Cambodia, almost three years ago. Those kids are the children of the poorest villagers in Roteang Village. Their parents are working on our farm project. We built a new school building for them - and the school is a literacy program. A sort of Headstart program. It prepares the kids to enter the village school. In fact, the kids are doing so well the principal at the village school wanted to know what we were doing. A volunteer on our board put up this profile over at Changing the Present. We also have a presence at Global Giving which has recently launched a new look for its site. Is Email A Chore? Is it still relevant to your work? Yes to Both, but ..
2=The thrill is gone from email, but still use it because many others I work with still use it. 3=Email is a chore, I prefer other ways to communicate with friends. 4=I hate email. It is so irrevelant that I only use it talk to my grandmother. About 5-8 years ago, I used to do a workshop called "Information Coping Skills" for people who felt overwhelmed by the information age. The online resources are here. I used the "getting to zero" and "getting things done" frameworks to teach people methods for being efficient with email. 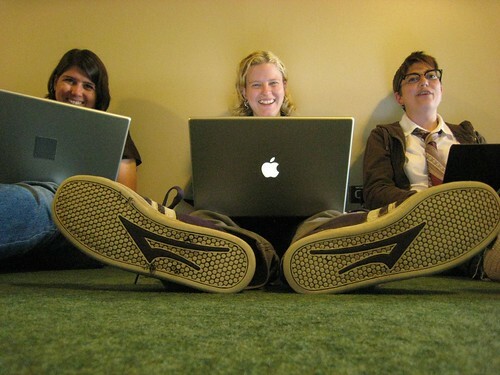 (Holly from NTEN has a post "Is Your Email Managing You?" and points to the video version of this slide deck.) The idea is that if you're overwhelmed, there's a problem in the way you work with the tool. I recently stumbled across this YouTube video of Robert Scoble discussing how he processes his 10s of 1000s of emails. It is interesting to hear how other people organize and process their email. I'm constantly on the search for ideas to make email less of chore. The Better Gmail Firefox extension has been wonderful. The color coding of labels has been very helpful. It also prompted me to really think the way I organize by labels (which are folders). In Outlook, my folders were topical, not organized by workflow. So, instead of a project name, I now have all my "follow up" in one folder, "to write" in another. I'm still struggling with not being overwhelmed and trying to not to loose things. I wish someone would write a "Getting Things Done With Gmail." I really miss the ability to sort by sender and subject line. That was how I navigated to what I needed. Now, I have to put a label on it or remember and use search. The google calendar doesn't sync with my treo, although I can read my calendar online if I have an Internet connection. That isn't a good thing for me. The same thing with contacts, although I discovered that Plaxo 3 does synch with gmail. So, I'm really dependent on an Internet connection to get to my information. Is there a way to get an offline copy of your contacts and calendar - and be able to add and sync? I keep loosing email. Now, to be honest, not sure I'm deleting stuff or not. Scoble mentions in the video that there are different type of email users - "gmail users" versus "outlook users" - and their habits are sort developed or shaped by the software itself. Therefore, I am understanding my this habit shift - from Outlook to gmail - is a little difficult for me. I haven't reverted back, I've thought of it ..
Web-based email is slower and I'm doing more clicks. "While email may be becoming more irrelevant for teenagers and older power-users of the Internet and other digital technologies, it certainly is NOT irrelevant for most K-12 teachers in the United States in my perception and possibly K-12 teachers elsewhere around the world." Maybe, but the thrill is gone. Email subscriptions to my newsletter have leveled off (though RSS continues to climb). Meanwhile, the number of useful emails in my inbox has been steadily dropping. Wesley Fryer, Moving at the Speed of Creativity, July 20, 2007. Perhaps we need this software? I met Jonny Goldstein through the video blogging community when I asked for help for the NTC Video Blogging panel. Jonny helped organize the panel -- and not only did I learn a lot more about the topic, but I had lots of fun. Jonny is really funny! He's recently launched a Web Talk Show called "Jonny's Par-Tay!" and I'm honored that he invited me to be the guest on his second show. See you at the Par-tay. What you need: Viewers just need a computer connected to broadband. Interaction: during the show, you can participate in the group text chat, and if you have webcam, I may be able to put you on air. 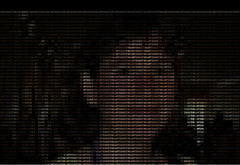 Amit Agarwal created Ascii Mugshots - Photo-realistic face portraits of 100 popular bloggers done in ASCII Text. My portrait is here. Ryanne and Jay are In Cambodia Now! I'm so excited. Ryanne and Jay have landed in Cambodia. I noticed that they were online so pinged them with IM. Jay told me that he paid 4,000 riel for coffee which probably equates to less than what you'd pay for two Starbucks Coffees in the US - but I'll let my Cambodian colleagues confirm that. The video that they made about their trip brought tears to my eyes. It reminded me of my first trip to Cambodia to meet my son, Harry. No video camera back then. And, I had similar internet access problems trying upload the photos from my Mavoica floppy disk camera. Funny how the welcome mat at the airport is different. On Thursday, I was able to do a full-day - 2 two hour workshops for nonprofits on Web2.0. What a fantastic opportunity to break the mold from the 90 minute conference panel quick hit! In the morning, I did the interactive presentation - where I was able to engage participants in a discussion about web2.0 and explore the benefits and challenges. The afternoon was devoted to doing the game. We had time ... and it was great. One thing I was able to accomplish was duirng the report. As the groups reported on their strategy sessions and picking the cards, I was able to demonstrate some approaches to using the tool. Boy, the attention was sure focused after people had spent an hour discussion how they might apply the tools. Then during the report out, I told people that I uploaded photos of them doing the game onto flickr. And wanted to show them that photosharing was about having a conversation around photos. Then, I scrolled down to the comments. I asked them, why are there so many comments. Then I told them I had twittered. We read the comments outloud. Then I lead a discussion with the group about whether or not Twitter might be useful. Guess what, some light blubs went off. What a demonstration!